Friday is here. I wish everyone a good weekend! I don't have any plan in my mind yet for this weekend. But sure we will look forward to enjoy our relaxing weekend. I might need to re-organize the kitchen and dining rooms cupboards. It has been a while since I did that. Probably I will find some 'treasures' in those cupboards. I love to buy cute props but sometimes I forgot about them, especially if I put them in the upper side of the cupboards :p Last night I took out some cute chocolate molds from ….. reading room. I'm ashamed! My stuffs are all over the house. I think I have to stop shopping these cute stuffs. Today's bento was inspired by Little A. Love letter bento for my kids. 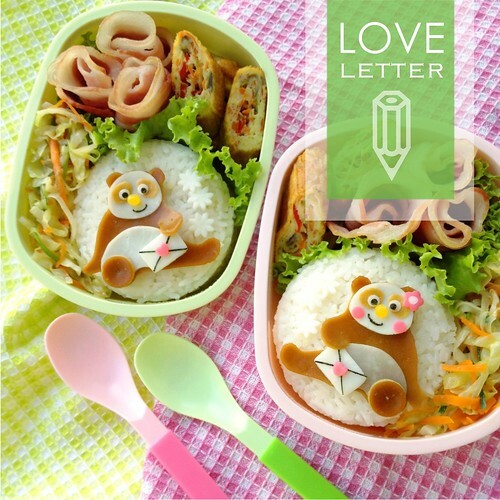 It would be a nice surprise for them to see two 'love letters' inside their bento bag today. Hope they will always remember that we love them very much. Inside the box : round shaped rice stuffed with sauteed pork & tofu inside, stir fry veggies (carrot, cabbage, spring onion), tamagoyaki, and steamed thinly sliced pork belly with ginger. aww.. thats so sweet, i bet Big A and little A will be touched by your love letters sent by the Pandas. Awww, so sweet! Gorgeous little bears with cute letters. I'm sure the kids are very aware that you love them to bits and when they'll get older and look back at this blog and see how much love and dedication you put everyday in their lunchboxes, they'll see the confirmation of what they already know : that you're a great mom. Heehee! So adorable! But I especially love the bunny with heart balloon from previous post. I wish I could eat your lunches, they look so yummy! Yikes, don´t remind me about my baking/confectionary making junk :P. Omigosh, I totally understand you... I had cake molds in my bedroom closets! Ahaha, I think I need therapy. Hi Lia. Love all your bento. Your bentos never fail amazed me!! these mail-bearing sweeties are so cute! always impressed with the precise cutting details and creativity you bring to your work. the food looks appetizing and elegant as always, too!